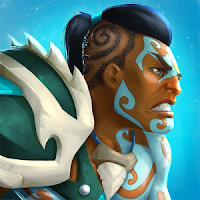 Wartide Heroes of Atlantis (MOD, Energy/No Skill CD) - A fascinating role-playing game for your android device in which you can test and improve your army command skills. You will also have the opportunity to collect your generals and their troops, in order to improve their combat skills. You are waiting for not a few strong rivals, so you will not have an easy way in rebuilding your empire.